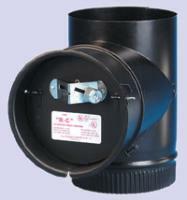 Barometric dampers, mostly used on oil burners, stabilize flue draft by drawing "room air" into the flue. Why do this? Too much draft causes erratic burning and wasted fuel. A stable draft provides stable heat and efficient fuel consumption. Barometric Damper With Tee; 5"
Barometric Damper With Tee; 6"
Barometric Damper With Tee; 8"